The Red Run and Bear Creek, just small creeks back in the 1800s, has blossomed into an open major inter-county stormdrain flowing through Warren, into the Clinton River, and onwards to Lake St. Clair. The Village of Warren and most of the surrounding Township of Warren, together with Van Dyke, incorporated as a city in 1957, less the city of Center Line, which had incorporated as a village from Warren Township in 1925 and as a city in 1936. Between 1950 and 1960, Warren's population soared from 42,653 to 89,426. This population explosion was fueled by the post-WWII Baby Boom and later, by white flight from its southern neighbor of Detroit in that decade. This change in population continued into the next decade when the city's population doubled again, ultimately reaching a high of 179,000 in 1970. The subsequent decades have seen Warren's population decline, while violent crime has increased. Combined with collapsing housing prices, down -53% between 2011 and 2016, this has led Warren to a number 7 ranking in Forbes' Most Miserable Cities to Live in the US; joining two other Michigan cities, Detroit and Flint, in the Top 10. According to the United States Census Bureau, the city has a total area of 34.46 square miles (89.25 km2), of which 34.38 square miles (89.04 km2) is land and 0.08 square miles (0.21 km2) is water. 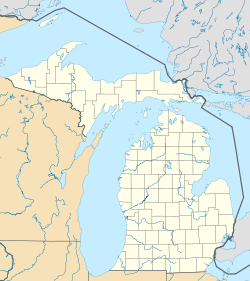 The city covers a six-mile-by-six mile (10 km x 10 km) square in the southwest corner of Macomb County in suburban Detroit (minus Center Line, which is a small city totally enclosed within Warren). Other cities bordering on Warren are Detroit, Hazel Park, Madison Heights, Sterling Heights, Fraser, Roseville, and Eastpointe. I‑696 cuts east and west through the middle of Warren. Mound Road is an important north-south artery in the city. East-west travel is mainly on the mile roads. Most notable are 8 Mile Road, which is on the southern border of Warren with Detroit; 11 Mile Road, which serves as a service drive for I-696, and 14 Mile Road, which is on the northern border of Warren with Sterling Heights. The city's age distribution was 22.9% under 18, 7.6% from 18 to 24, 30.8% from 25 to 44, 21.4% from 45 to 64, and 17.3% who were 65 or older. The median age was 38 years. For every 100 females, there were 95.6 males. For every 100 females age 18 and over, there were 92.1 males. For 2000 the non-Hispanic white population of Warren was 90.4% of the total population. African-American were 2.7% of the population (which is the same as the total non-white population in 1990), Asians were 3.1% of the population, Native Americans 0.4%, other groups 0.3% and those reporting two or more races were 2.2% of the population. Hispanics or Latinos or any race were 1.4% of the population. Warren's population was as of 2000 one of the oldest among large cities in the United States. 16.1% of Warren's population was 65 or older at the last census, tied for fifth with Hollywood, Florida among cities with 100,000+ population, and in fact the highest-ranking city by this measure outside of Florida or Hawaii. Warren is ranked 1st in the nation for longevity of residence. Residents of Warren on average have lived in that community 35.5 years, compared to the national average of eight years for communities of 100,000+ population. Warren remains a population center for people of Polish, Lebanese, Ukrainian, Scots-Irish, Filipino, Maltese and Assyrian/Chaldean descent. As of the census of 2010, there were 134,056 people, 53,442 households, and 34,185 families residing in the city. The population density was 3,899.2 inhabitants per square mile (1,505.5/km2). There were 57,938 housing units at an average density of 1,685.2 per square mile (650.7/km2). The racial makeup of the city was 78.4% White, 13.5% African American, 0.4% Native American, 4.6% Asian, 0.4% from other races, and 2.6% from two or more races. Hispanic or Latino of any race were 2.1% of the population. Between 2000 and 2010, the Asian population in Warren increased to almost 6,200, a 46% increase. This was a much slower growth rate than that of the African-American population that grew from 3,700 to over 18,000 or a more than 300% increase. The 2014 Census estimate placed Warren's population at 134,398 and the 2015 census estimate placed the population at the 2015 estimate placed the population at 135,358. The Asian percentage was now at roughly 6%, up from the previous 4.6% and at 7,800. Latinos, Native Americans, Pacific islanders, those reporting two or more races and those reporting some other race were not noticeably changed from the 2010 percentages. Companies based in Warren include Big Boy Restaurants, and Art Van. The Warren municipal government is composed of a Mayor, City Council, Clerk, and different boards and commissions. Boards include the Zoning Board of Appeals, Board of Review, Employee Retirement Board of Trustees, and Construction Board of Appeals. Commissions include Animal Welfare, Beautification, Compensation, Crime, Cultural, Disabilities, Historical, Housing, Library, Planning, Police & Fire, and Village Historic District Commissions. The City of Warren established a Christian prayer station at city hall that is operated by the Pentecostal Tabernacle Church of Warren. Douglas Marshall requested establishing a reason station. Mayor James R. Fouts personally refused to grant Marshall's request in a letter based, in part, on the claim that the station would disrupt those using the prayer station. The American Civil Liberties Union, Americans United for Separation of Church and State, and Freedom from Religion Foundation jointly filed a complaint against the city. In 2015 there was a $100,000 judgment against the city government and mayor James R. Fouts for denying Marshall the right to establish his atheist station. The United States Postal Service operates the Warren Post Office. Southeast Warren consists of the Belangers Garden, Berkshire Manor, Piper Van Dyke, Warrendale, and the southern portion of Warren Woods. The neighborhood population in 2009 was 33,031. The neighborhood's racial makeup was 70.14% White, 15.50% African-American, 2.27% Asian, 0.38% Native American, and 6.80% of other races. 1.84% were Hispanic or Latino of any race. The neighborhood's median household income in 2009 was $35,136. The per capita income was $15,301. Shaw Park located in Southwest Warren. Wayne State University's Advanced Technology Education Center. The City of Warren has a Department of Parks and Recreation which oversees the Aquatic, Community, and Fitness Centers along with a system of 24 parks. The Warren Symphony Orchestra gives several concerts per season and changed its name to the Warren Symphony Orchestra in 2016 In 2003 the city built a brand new Community Center where the old Warren High School was. There is also a nine member Cultural Commission. The Italian American Cultural Society (IACS) had been located in Warren for a 20-year period. In 2004 it moved to its current location in Clinton Township. Its previous location was sold to a charter school in July 2004. Rising Violent Crime in Warren is coupled with decreasing population. In 2001 Warren had a population of 138,976 and reported 63 forcible rapes, 191 aggravated assaults and 559 burglaries. By 2012 the number of rapes had increased by 44% to 91, aggravated assaults had more than doubled to 476, as had burglaries to 999, while the population had declined by 4,600. The city has a high violent crime rate of 532 per 100,000 in 2012, 43% higher than the US national average of 371 per 100,000. Since 2000, there have been thirty-five reported murders; five in 2001, three in 2003, six in 2004, five in both 2005 and 2006, seven in 2007, and four in 2008. Additionally, about two dozen markers have been placed around designated sites in the city by the Warren Historical and Genealogical Society. Norm Augustinus, cult writer, comedian, actor; attended McKinley Elementary; featured Warren as backdrop to bestselling book Cats & Dogs. Alex Avila, major league baseball catcher, attended high school in Warren. Bruiser Brody, professional wrestler, attended high school in Warren. Eminem, rapper and recording artist, attended Lincoln High School. Denny Felsner, former NHL player, born in Warren. Alex J. Groesbeck, former Governor of Michigan, born in Warren. Grant Hochstein, figure skater, born in Warren. Matt Hunwick, active NHL player, born in Warren. I See Stars, electronicore band, formed in Warren. Joe Kopicki, NBA player, born and raised in Warren. Mitch Ryder, rock and roll singer and recording artist, attended school in Warren. John Smoltz, MLB pitcher in Hall of Fame, born in Warren. Matt Taormina, active NHL player, born in Warren. Doug Weight, retired NHL player, born in Warren. ^ Frank DeFrank; MDN staff (November 7, 2007). "Fouts in a rout". The Macomb Daily. Retrieved 2 February 2014. ^ US Census Bureau Public Information Office. "U.S. Census Bureau Delivers Michigan's 2010 Census Population Totals, Including First Look at Race and Hispanic Origin Data for Legislative Redistricting - 2010 Census - Newsroom - U.S. Census Bureau". ^ Wesley Arnold. "Abel and Sarah Warren Pioneers". ^ Brush, Mark. "Forbes: Detroit and Flint are the top 2 most 'miserable cities' in the U.S." Retrieved 29 November 2016. ^ "2006 American Community Survey (ACS)". Retrieved March 31, 2008. ^ "Warren (city) QuickFacts from the US Census Bureau". ^ a b c Bureau, U.S. Census. "American FactFinder - Results". Retrieved 29 November 2016. ^ Metzger, Kurt R. "The Elderly Aren't Just in Florida Anymore" (pdf). Center for Urban Studies, Director, Michigan Metropolitan Information Center (MIMIC). Wayne State University. Retrieved March 28, 2011. ^ Bureau, U.S. Census. "American FactFinder - Results". Retrieved 29 November 2016. ^ Burns, Gus. "Warren must pay $100,000 for denying atheist 'reason station' next to Christian 'prayer station' in City Hall" (Archive). MLive. March 5, 2015. Updated March 6, 2015. Retrieved on July 13, 2015. ^ "Federal Lawsuit Challenges Michigan City's Rejection of Atheist Display" (Press release). American Civil Liberties Union. July 23, 2014. Retrieved February 8, 2019. ^ Gryboski, Michael (July 24, 2014). "Atheists File Lawsuit Against Michigan City Over Rejection of 'Reason Station'". Christian Post. Retrieved February 8, 2019. ^ "WARREN." U.S. Postal Service. Retrieved on July 13, 2015. "28401 MOUND RD WARREN, MI 48090-9998"
^ a b c d "Warren, Michigan". ^ "Best Places to Live in the United States". ^ "Crown of Life Lutheran School". ^ "Offenses Known to Law Enforcement". FBI. ^ "Warren Profile - Warren MI - Population, Crime, Map". ^ a b c d "Michigan Historical Markers". The Michigan Historical Marker Web Site. MichMarkers.com. Retrieved 2008-04-15. ^ "St. Clement Catholic Church". The Michigan Historical Marker Web Site. MichMarkers.com. Retrieved March 28, 2011. ^ "St. Clement Catholic Church Cemetery". The Michigan Historical Marker Web Site. MichMarkers.com. Retrieved March 28, 2011. ^ "Warren Historical and Genealogical Society, Markers and Pictures in Warren, Michigan". ^ "Mitch Ryder & the Detroit Wheels". Michigan Rock & Roll Legends Hall of Fame. Retrieved June 2, 2014. ^ "NHL Players from Warren, Michigan - Regular Season Stats". QuantHockey.